There’s nothing more refreshing than a cold, tart glass of lemonade. Fresh lemon juice, maple syrup, and Tropical Strawberry Shakeology recreate the flavor, with a boost of superfood nutrition! Amp up the lemon even more by grating fresh lemon zest over the top of your smoothie before serving. Make this smoothie with Vanilla Vegan Shakeology by adding ¼ cup fresh or frozen strawberries. 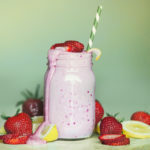 Make this fresh and refreshing vegan strawberry lemonade smoothie! Place water, ice, Shakeology, lemon juice, and maple syrup in blender; cover. Blend until smooth. Enjoy as part of breakfast.